Posted August 2, 2017 by admin & filed under Featured Bondi View. A local Bondi business has been involved in a dispute with a United States clothing giant, prompting Waverley Mayor Sally Betts to step in. Cosmetic and home products business Bondi Wash is fighting over a trademark of the word ‘Bondi’ with US clothing giant Abercrombie & Fitch. 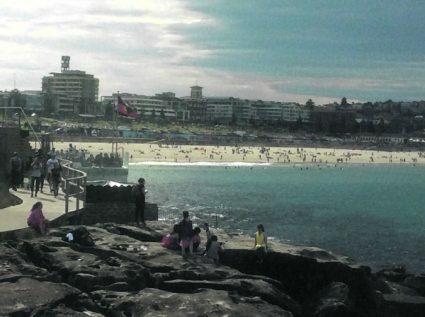 The US retailer (which does not operate in Australia) is the registered owner of trademark for ‘Bondi Beach’ in the US. When Bondi Wash applied to trademark its name in the US they were prevented due to the similarity of the name to that which Abercrombie & Fitch owned. “I’m assuming in Australia we are not allowed to trademark New York. An expert in trademark Law from the University of Technology, Sydney, Professor Isabella Alexander said that Waverley Council can always ask A & F to relinquish the mark but that Mayor Betts has got no legal standing to insist upon that “You can just appeal to their good will” Professor Alexander added. The efforts by Waverley Council to assist Bondi Wash in the matter follow a failed challenge by the retailer last year to challenge Abercrombie & Fitch’s claim over the trademark (and similar marks) on the grounds it believed the US company was no longer using the trademark. Last month, Bondi Wash withdrew its petition in the US and is pursuing alternative classification for its trademark in different categories. Professor Alexander said: “This case illustrates the problem of global branding. You can get your rights secured in one country and then you expand into another market and you find someone else happily operating using a trademark that is similar in name to yours…It’s a consequence of the way that goods now move around the world, crossing boundaries easily and quickly. Abercrombie & Fitch did have an outlet at Bondi Junction Westfield and one in Melbourne, but exited Australia in 2015 due to falling sales. Waverley Council’s letter to Abercrombie & Fitch will be finalised this week.